You never really wanted friends that would hang out on your couch, right? Based on PC Gamer's hands-on impressions of the mode from the E3 show floor, Tandem Bike is possibly going to end some friendships. One of the major draws to the Trials games is that feeling that it's your fault that you biffed that landing and have to start over; you just didn't get the right rotation, or you didn't brake soon enough. That handy "restart level" button drops you back in immediately so you can instantly try again, but you're most likely "on tilt" and you're gonna make a new mistake that frustrates you further and increases that feeling of "I will finish this level OR SO HELP ME!!!!" So, imagine all that with a buddy. You hit the brake and they hit the gas. The result? Nothing. The two actions cancel one another out and your bike continues its forward momentum as you plummet off a ledge to your doom below. Undoubtedly, this kind of repeated occurrence will lead to one of two things. The first, you kick your friend out of your house and never talk to them again. The second, you laugh hysterically and try again. The potential for some great co-op hijinks is high and hopefully folks will have more fun than frustration. 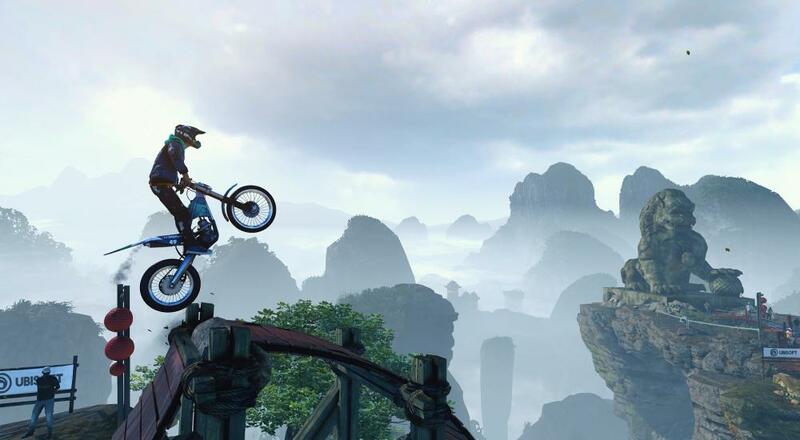 Trial Rising is set for a February 2019 (man, that's going to be a busy month) release and will be available on PC, PlayStation 4, Xbox One, and Nintendo Switch. Two player couch co-op will be supported in the "Tandem Bike" mode only. Page created in 1.1498 seconds.